An omphalocele is a birth defect in which an infant's intestine or other abdominal organs are outside of the body because of a hole in the belly button (navel) area. The intestines are covered only by a thin layer of tissue and can be easily seen. 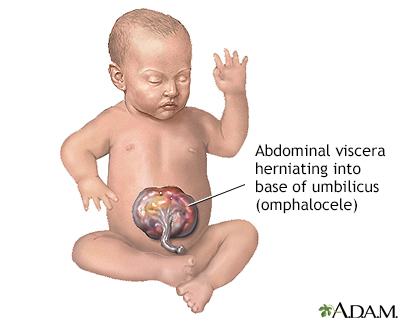 Omphalocele is considered an abdominal wall defect (a hole in the abdominal wall). The child's intestines usually stick out (protrude) through the hole. The condition looks similar to gastroschisis. An omphalocele is a birth defect in which the infant's intestine or other abdominal organs protrude through a hole in the belly button area and are covered with a membrane. In gastroschisis, there is no covering membrane. Abdominal wall defects develop as a baby grows inside the mother's womb. During development, the intestines and other organs (liver, bladder, stomach, and ovaries or testes) develop outside the body at first and then usually return inside. In babies with omphalocele, the intestines and other organs remain outside the abdominal wall, with a membrane covering them. The exact cause for abdominal wall defects is not known. 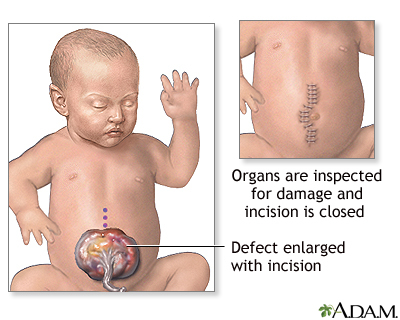 Infants with an omphalocele often have other birth defects. Defects include genetic problems (chromosomal abnormalities), congenital diaphragmatic hernia, and heart and kidney defects. These problems also affect the overall outlook (prognosis) for the baby's health and survival. An omphalocele can be clearly seen. This is because the abdominal contents stick out (protrude) through the belly button area. There are different sizes of omphaloceles. In small ones, only the intestines remain outside the body. In larger ones, the liver or other organs may be outside as well. Prenatal ultrasounds often identify infants with an omphalocele before birth. Testing is often not necessary to diagnose omphalocele. However, babies with an omphalocele should be tested for other problems that often go with it. This includes ultrasounds of kidneys and heart, blood tests for genetic disorders, among other tests. Omphaloceles are repaired with surgery, although not always immediately. A sac protects the abdominal contents and may allow time for other more serious problems (such as heart defects) to be dealt with first, if necessary. To fix an omphalocele, the sac is covered with a special man-made material, which is then stitched in place to form what is called a silo. 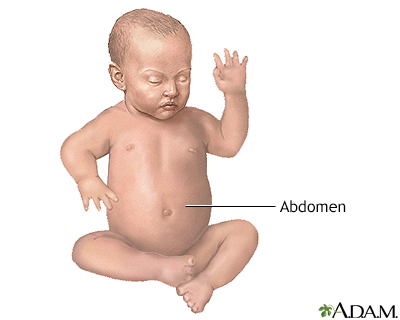 As the baby grows over time, the abdominal contents are pushed into the abdomen. 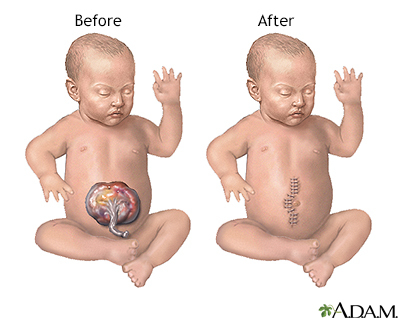 When the omphalocele can comfortably fit within the abdominal cavity, the silo is removed and the abdomen is closed. Sometimes, the omphalocele is so large that it cannot be placed back inside the infant's abdomen. The skin around the omphalocele grows and eventually covers the omphalocele. The abdominal muscles and skin can be repaired when the child is older for a better cosmetic outcome. Complete recovery is expected after surgery for an omphalocele. However, omphaloceles often occur with other birth defects. How well a child does depends on which other conditions the child has. If the omphalocele is identified before birth, the mother should be closely monitored to make sure the unborn baby remains healthy. Parents should consider testing the baby, and possibly family members, for other genetic problems that are associated with this condition. Another complication is bowel death (necrosis). This occurs when intestinal tissue dies due to low blood flow or infection. The increased pressure from the misplaced abdominal contents can decrease blood flow to the intestine and kidneys. It can also make it difficult for the baby to expand the lungs, leading to breathing problems. An omphalocele is an abdominal wall defect at the base of the umbilical cord (umbilicus); the infant is born with sac protruding through the defect which contains small intestine, liver, and large intestine.